Leonardo was a true rock star of his time. He decided that he wanted to be a painter, so he picked up some brushes and started painting masterpieces before the age of twenty. Then, he decided he wanted to be a musician, so he made his own lyre made out of silver and started jamming. Then, he decided he wanted to be an engineer, so he invented the helicopter. (Of course, technology of the time wasn't ready for his invention and it would take decades before technology could catch up.) Then, he decided that he wanted to be friends with the king, so he decided to start chilling with Francis I of France. If that wasn't enough, the guy also rocked a pretty sweet beard during his life. Yes, he's definitely the kind of Renaissance man you can look up to, so why wouldn't you want to dress like him for your next costume party? 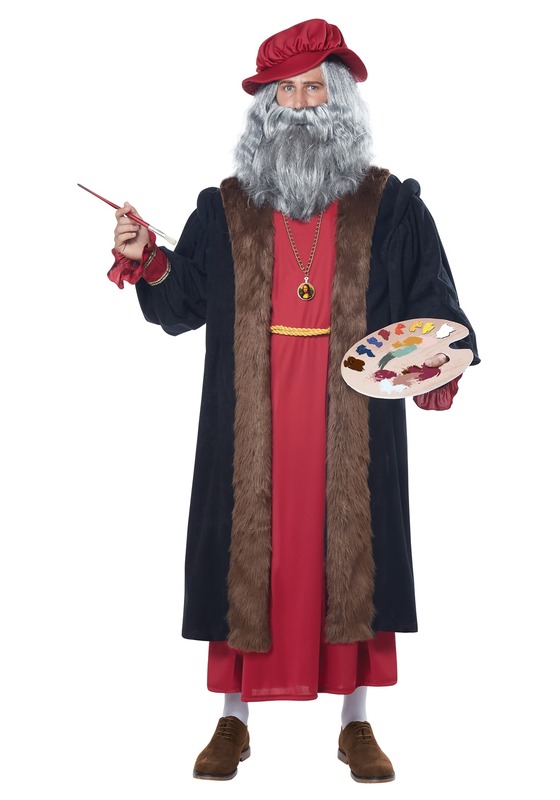 This Adult Leonardo Da Vinci Costume will have you looking like the genius artist in no time! With Renaissance style clothes that come with deep and luxurious reds, this costume hearkens back to the popular image of the historical figure. You may start to feel a little bit like a genius yourself when you wear it. Just make sure you practice your Latin when you wear this costume, since Da Vinci could write it backwards like pro!